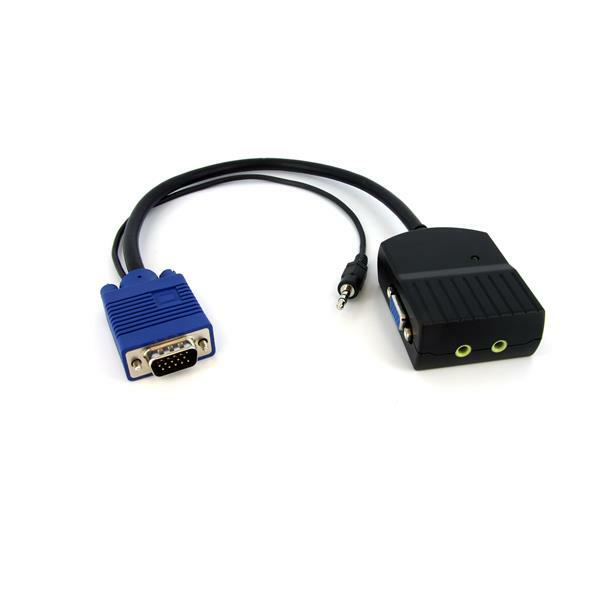 The ST122LEA 2 Port VGA Video Splitter with Audio and USB power is our most compact VGA splitter, allowing a computer to simultaneously display VGA video on two monitors from a single source. Support for resolutions up to 2048x1536 resolution and stereo audio makes this device perfect for classrooms, tradeshows, or any environment requiring high quality video on several displays. 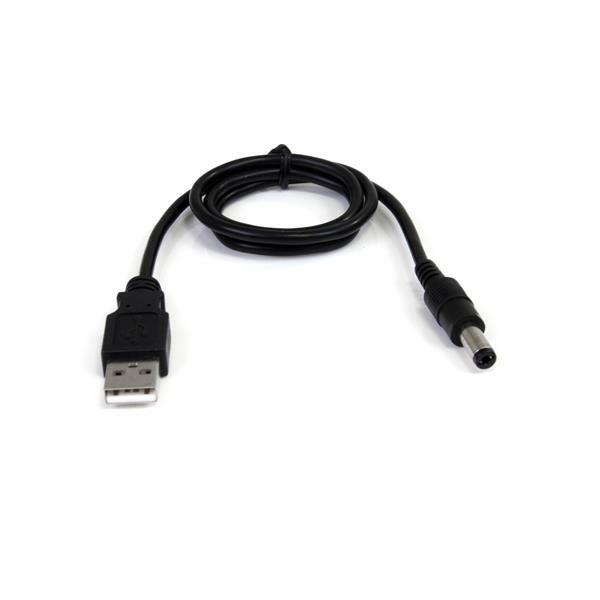 This VGA splitter is able to draw power from your source PC or media player using an available USB port, instead of using a conventional power adapter making it easy to install where power outlets are not available. The splitter also features a built-in booster circuit that allows you to locate VGA monitors up to 200ft away from your system. Backed by a StarTech.com 2-year warranty and FREE lifetime tech support. 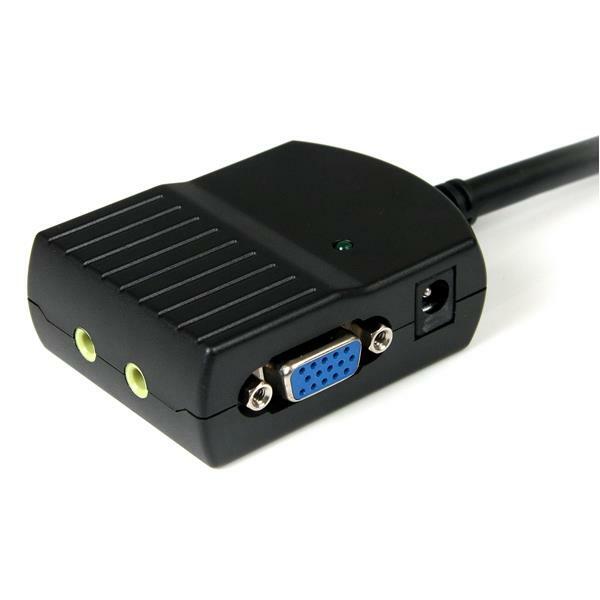 How do I convert the VGA output port on this device to DVI, HDMI, or DisplayPort? This device outputs a VGA signal. If you have a display or video destination that uses another type of video connection, there are ways that you can convert the video signal or connection. These options are outlined below and organized by the target connection. 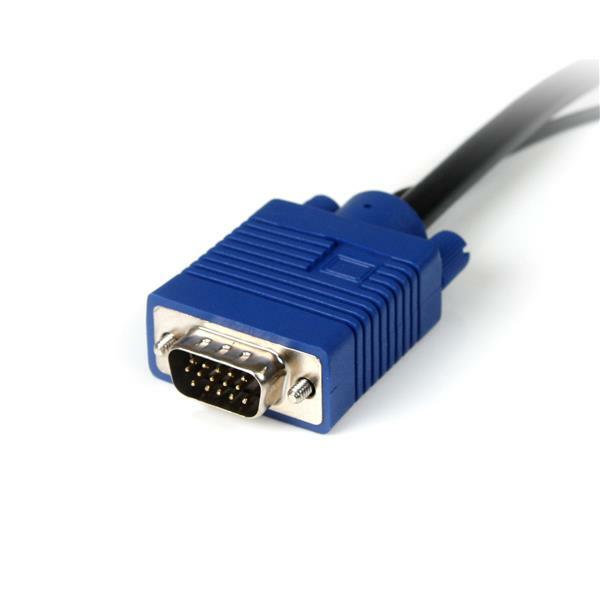 DVI-D VGA to HDMI: https://www.startech.com/AV/Converters/Video/?filter_AVINPUT=VGA&filter_AVOUTPUT=HDMI. HDMI to DVI-D: https://www.startech.com/AV/Converters/Video/?filter_AVINPUT=VGA&filter_AVOUTPUT=HDMI. DisplayPort VGA to HDMI: https://www.startech.com/AV/Converters/Video/?filter_AVINPUT=VGA&filter_AVOUTPUT=HDMI. HDMI to DisplayPort: https://www.startech.com/AV/Converters/Video/?filter_AVINPUT=HDMI&filter_AVOUTPUT=DisplayPort. Note: You might need to use more than one converter as part of your solution; however, you should try to use the least number of converters and cables to connect your source and destination. If you have the option to convert to multiple target video connections, choose the option that requires the fewest number of conversions. When you convert from VGA to DVI, you need to know if you are converting to a DVI-I or a DVI-D connection. For more information about how to identify the type of connection that you need, refer to the following FAQ: https://www.startech.com/faq/video_signal_converters_dvi_interface. You also need to know which form of DVI that you are using, because DVI-I supports both analog (VGA) and digital (HDMI) signals, while DVI-D only supports digital (HDMI) signals. Note: Certain devices may have a DVI-I connection but only support DVI-D signaling. It is important to verify that your DVI-I device supports DVI-I signaling. How do I convert from my video source's DVI, HDMI, or DisplayPort output port to this device's VGA input port? This device has a VGA input port. If you have a video source that uses another video connection, there are options available to convert the video signal or connection. These options will be outlined below for each video source connection. 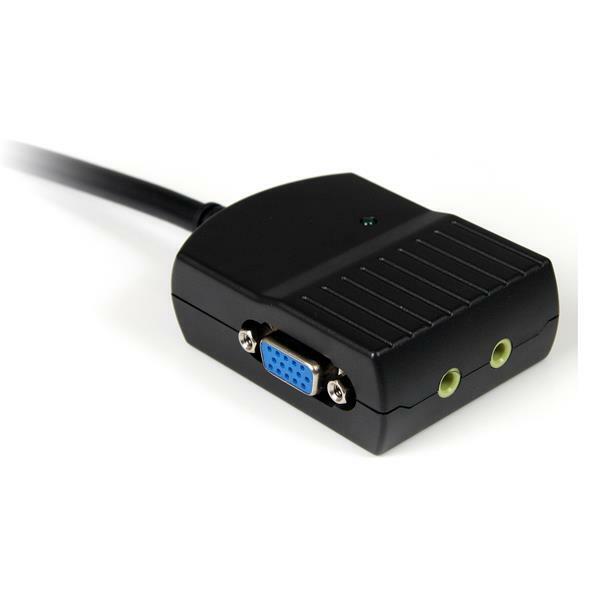 When you convert from DVI to VGA, you need to know if you are converting from a DVI-I or a DVI-D connection. For more information about how to identify the type of connection that you have, refer to the following FAQ: https://www.startech.com/faq/video_signal_converters_dvi_interface. You also need to know which form of DVI that you are using, because DVI-I supports both analog (VGA) and digital (HDMI) signals, while DVI-D only supports digital (HDMI) signals. Some DVI-I connections only support DVI-D signaling. In this case, you must use a DVI-D to VGA converter. Note: When you are testing setup components, you should avoid using video adapters. For example, if you are converting a VGA source to HDMI for use with an HDMI splitter, you should use an HDMI source when you test the components. Use the cable, video splitter, video source, and video destination in another setup to see if the problem is with the components or the setup. Use a different cable, video splitter, video source, and video destination in your setup to see if the problem persists. Ideally, you should test a component that you know works in another setup. Remove the video splitter from your setup and test to make sure that the video source and video destination work together without the video splitter. Note: In order for your setup to work properly, the video source, splitter, and destination all need to support the resolution that you are using. Which port on the video splitter is the master port? Video splitters take the output for monitor port 1 and mirror it to the remaining outputs. By default, the first output port is the master port that is mirrored to each additional monitor. 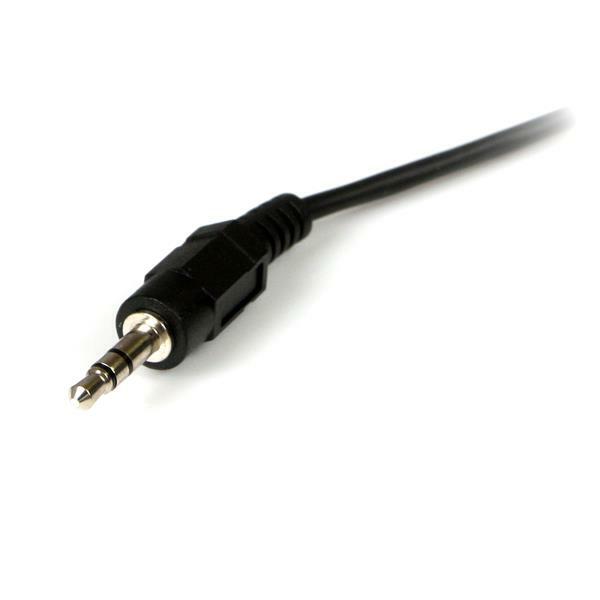 Make sure that you use the first output port when you use the video splitter. The master port is labeled on the splitter boxes from StarTech.com. On the splitter cables from StarTech.com, the master port is the top port. Unplug all of the video connections. If the splitter is powered, power cycle the splitter. Plug in all of the video connections again. Make sure that the first video connection plugged in is the one that you want to be the master port. The image quality on some or all of my displays does not look very good through the video splitter. What do I do?